Blondie Boopadoop (her maiden name, and Betty Boop had not yet popularized the expression) was designed to follow in the footsteps of Young's earlier creations, The Affairs of Jane, (no relation) Beautiful Babs and Dumb Dora, all of which were "pretty girl" strips of the sort made popular by Polly & Her Pals. Tho the strip started September 8, 1930, it wasn't until Feb. 17, 1933, that Blondie finally married the steadiest of her boyfriends, the wealthy Dagwood Bumstead. But — Dagwood isn't wealthy! Not anymore, he isn't. His father, railroad tycoon J. Bolling Bumstead, disowned him for marrying the declassé Blondie. To make ends meet, he had to go to work at the Dithers Construction Company, where he has slaved ever since. Now, living next door to Herb and Tootsie Woodley and clashing daily with Mr. Beasley, the mailman, it's hard to believe he was born into a different life. In 1934, Blondie's son Alexander (originally known as "Baby Dumpling") was born, boosting the King Features strip's popularity to extraordinary heights. It soared even higher with the addition of their daughter, Cookie (no relation), and higher yet when their dog, Daisy (no relation), and all her pups, joined the cast. Whitman Publishing brought out Big Little Books about her adventures. She became the subject of a weekly radio series. Most memorably, Columbia Pictures inaugurated a series of feature films with Blondie (1939), with Penny Singleton in the title role and Dagwood played by Arthur Lake (whose first starring role was another comic strip character, Harold Teen). By 1950, when the series ended, there were over two dozen of them. Then came TV. Arthur Lake reprised his role in a series that started January 4, 1957, on CBS, with Pamela Britton as Blondie. Kayro Productions (Calvin & the Colonel) produced a second series, which debuted in syndication on September 26, 1968, but it only lasted three months. This one featured Patricia Harty as Blondie and Will Hutchins as Dagwood. Jim Backus (Thurston Howell III in both live-action and animated productions), who played Mr. Dithers, had a more prominent toon connection as well — he was the voice of Mr. Magoo. The strip is even a member of that select company (including The Timid Soul, Li'l Abner and Keeping Up with the Joneses) that have contributed to our language, as anyone who has ever raided the refrigerator to make a "Dagwood sandwich" can attest. In 1948, Chic Young won the National Cartoonists' Society's prestigious Reuben Award for his work on Blondie. Another notable honor came in 1995, when Blondie became one of 20 strips, including Alley Oop, Nancy and Little Nemo in Slumberland to be part of the "Comic Strip Classics" series of U.S. postage stamps. Blondie never made it big in animation, but she did appear in a TV special aired May 15, 1987. Loni Anderson (well known for face acting but with few voice credits) did the voice of Blondie, with Frank Welker (Dynomutt) as Dagwood. She was a much bigger star in comic books, starting with Ace Comics, where she appeared in the 1937 first issue (along with The Katzenjammer Kids, Krazy Kat and other King Features characters). She began appearing sporadically in her own title in 1942. Starting in 1947, Blondie Comics was published on a regular basis. It ran, through a succession of publishers (McKay, Harvey, King, and finally Charlton Comics), until 1976, sparking ancillary titles (including Dagwood, Blondie & Dagwood Family, and even Daisy & Her Pups) along the way. 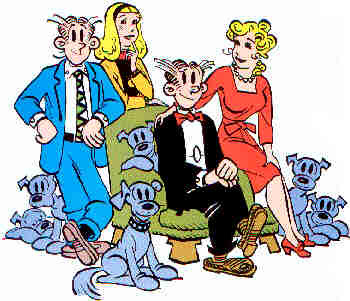 Today, Blondie stars in the quintessential family comic strip under the direction of Young's son, Dean, who has done it with a succession of artistic collaborators. They include Jim Raymond (brother of Alex Raymond, of Flash Gordon fame — and by the way, Alexander Bumstead was named after Alex Raymond) and Stan Drake (who also drew The Heart of Juliet Jones in a radically different style). The current artist is Dennis LeBrun. Whoever draws it, the look of the strip is carefully maintained. It appears immune to the ravages of time in other ways, as well. Or — does it? Blondie is no longer just a housewife, but also runs a catering service; and Dagwood is the Dithers Corporation's Webmaster. Perhaps one of the secrets of the strip's success is its ability to retain its timeless appeal, even while staying current. Whatever the reason, after three quarters of a century, Blondie is still popular enough to have had the biggest 75th anniversary celebration ever seen in comics. In the weeks leading up to the big day (Sept. 8, 2005), dozens of other comics, from Mutts to The Family Circus, celebrated with her either by making reference to her, or doing an actual guest appearance in her strip. Blondie may not be in movies or on TV anymore, but the eagerness with which other cartoonists' creations joined in proves she's still one of the biggest names in comics. Text ©1999-2010 Donald D. Markstein. Art © King Features.